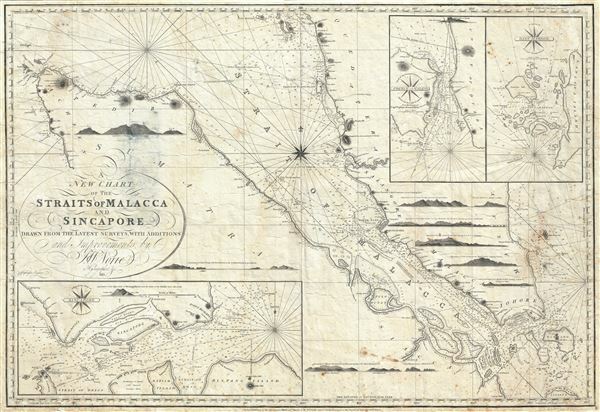 A New Chart of the Straits of Malacca and Sincapore Drawn from the Latest Surveys, with Additions and Improvemetns, by J. W. Norie. An extremely scarce 1815 map of the Strait of Malacca and Singapore (Sincapore) by John William Norie. This map covers from Aceh in northwestern Sumatra (Acheen) to Singapore Island and Pulu Bintang. This map first appeared in 1803 when it was issued by William Heather. Only one known example of the Heather edition exists and this is held in the archives of the British Library. The present example was issued and updated by Heather's heir John William Noire. Norie published at least two editions, the present example, 1815, and another example dated 1831. Since Noire took over Heather's business in 1812, it is a safe assumption that this is the first Norie edition of this map. It is the only known example. John William Norie (June 3, 1772 - December 24, 1843) was a British teacher of navigation, hydrographer, chart maker, and publisher of maritime manuals active in London, England in the late 18th and early 19th centuries. Norie was born in Wapping, London, an area long associated with the maritime sciences. Norie's career as a chart maker commenced under the tutelage of William Heather, a prominent purveyor and publisher of nautical charts, pilot books, and navigational tools who took over the firm of Mount and Page in 1765. Heather and Norie were likely acquainted through John Hamilton Moore, another important chart maker with whom both seem to have been associated early in their careers. Heather hired Noire to teach basic navigation at his shop at 157 Leadenhall Street. Under Heather Norie also distinguished himself as a draftsman, completing many of the early charts associated with the Heather firm. When Heather died in 1812 John Norie partnered with George Wilson, a moneyed 'man about town' with little experience in the maritime trades, to acquire the map and chart business at 9500 British Pounds. It proved a good deal for Norie, who retained all copyright privileges and drew 1/4 quarter share of business profits, as well an impressive quarterly salary and, for doing all of the work, 1/3rd of Wilson's share. The firm, referred to as the 'Naval Warehouse' quickly acquired a reputation for quality navigational materials and became a favorite of merchant seamen. It was even referenced in Charles Dickens' classic novel Dombey and Son. In 1819, Noire and Wilson acquired the failing chart business of David Steel, which significantly increased the size, though not quality, of their chart catalogue. With the rise of the British Admiralty and its own maritime chart productions, the business of "Chart Purveyor" in London dramatically changed. Admiralty charts and pilot books, designed for military use, were offered through established intermediaries, like Norie, at bargain prices. Most chart makers of the period found it profitable to use the highly technical Admiralty charts to update their own more decorative vernacular charts. For a brief time this practice proved exceptionally profitable but eventually began to draw criticism. Nonetheless, Noire retired to Edinburgh in 1840 and died a wealthy man in 1843. In 1840 the business passed to a nephew of George Wilson, Charles Wilson, who renamed the firm "Norie & Wilson". William Heather Norie, J. W. Norie's own son, produced few charts, instead pursuing a career in the legal field. Norie & Wilson merged with James Imray's prosperous chart business in 1899, becoming Imray, Laurie, Norie & Wilson, a profitable concern that remains active in the maritime charting industry. Very good. Some verso repairs. Slight discoloration near title. Edge wear.